Challenge: How can we create a more efficient system which makes the preparations for the anesthesia procedure quicker and less time consuming, without compromising access to all the materials and drugs needed, and at the same time, follow hygiene regulations, and ensure no excess waste is being produced? 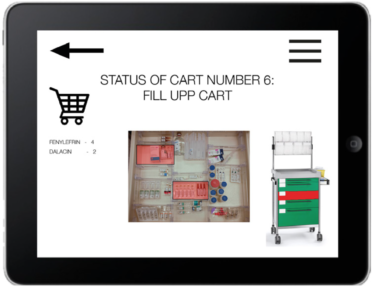 Concept: An app to be used by anesthesia nurses and that serves as a signalling between shifts, to convey to the next nurse if the anesthesia trolley has been filled up or not. The job of the anesthesia nurse is to look after the patient’s vitals during surgery, and make sure that the patient is pain-relieved and asleep. The anesthesia nurse therefore has a critical function in any surgery. Because hygiene is of utmost importance in the operation theater there is a strict protocol that have to be followed. The limitation of the protocol can make what would appear as simple work quite complex and time-consuming. For example, the article supply system for anesthesia is of great difference from normal supply system serving the same purpose. During the surgery, the anesthesia nurse in charge is not allowed to leave the theater to get articles. All they can do is call another colleague and ask them to bring the items they need momentarily. In this report, we document a challenge from anesthesia nurses and the problems we found from our study visit to the hospital Södersjukhuset. We also recorded our whole Design Thinking process to find several possible solutions to solve the problems.